A presentation to the Community Board 6 Waterfront Committee last week showed a bold vision of a future Gowanus Canal: public spaces and on-water access, community gardens and rock climbing — and, of course, boat launches. The March 20 presentation came courtesy of the Gowanus Dredgers, a canoe club that advocates for recreation and restoration of the Gowanus Canal. Now that the notoriously polluted waterway is in the center of a neighborhood rezoning, activists like the Dredgers are attempting to get ahead of the curve, laying out an expansive vision of what waterfront design could be in Brooklyn. Owen Foote, a member of the Dredgers, said they wanted to avoid the city laying down the same underutilized waterfront esplanades from every previous project along the Gowanus and are instead advocating for “integrated waterfront service facilities,” ranging from boathouses and floating walkways to dining and public space. 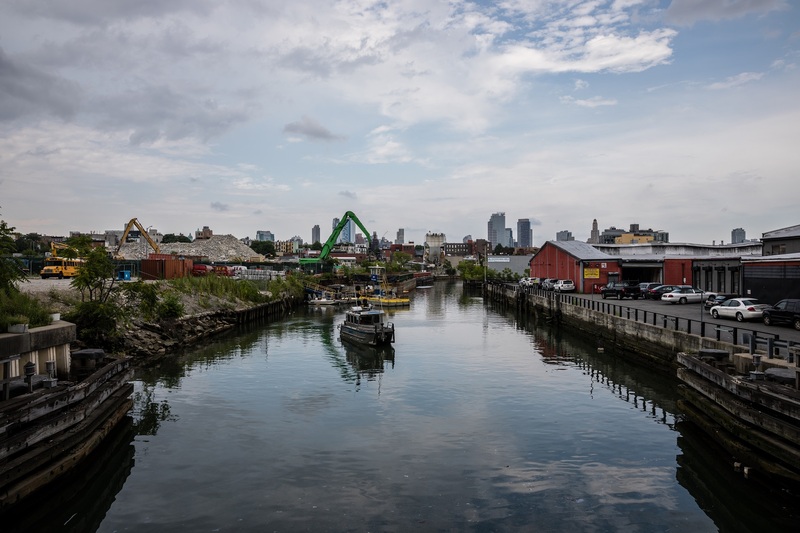 As the city prepares plans for the rezoning in Gowanus, residents are speaking out against the high-rise development and the increased density that comes with it. But one of the defining elements in the neighborhood — the canal — provides an opportunity to capitalize on lessons learned in Brooklyn’s previous waterfront rezonings. When the Department of City Planning presented a rezoning proposal to the Community Board 6 Land-Use Committee in February, the Waterfront Access Plan looked like a standard New York City waterfront design: visual corridors between developments, public esplanades with curving pathways, benches — and very little interaction with the water. The city made a similar effort back in 2009 toward innovation in the Williamsburg/Greenpoint waterfront rezoning, adding a text amendment to city waterfront design that was later adopted citywide. The amendment expanded design standards from a strict, all-guardrail approach on the city’s waterfront to allow for newer approaches to waterfront access, like riprap shorelines, which are constructed from boulders, or get-downs, which provide types of stepped access to the water. But a decade later, as high-rise condos of 30 and 40 stories spring up along the North Brooklyn shoreline, residents are worried they aren’t getting what they were promised in the rezoning. North Brooklyn residents gathered in Greenpoint last December to discuss waterfront design and development with representatives of the DCP. The meeting was initiated by the increasingly vocal dissatisfaction of Williamsburg and Greenpoint residents with the reality of design along the waterfront. Rezoning doesn’t come around often, but when it does, the effects are literally set in stone. When the publicly accessible space at Greenpoint Landing opened last year, residents found the design sterile in comparison to original discussions. The bulkhead walls and railings above the water prevent the kind of direct interaction that many hoped for. No get-downs to the water have been planned along the waterfront, and the Community Board 1 Parks committee rejected a city design for the nearby Box Street Park mainly based on its lack of waterfront access, sending designers back to the drawing board to come up with a new plan. There are “nice parks that don’t have a great connection or interaction with the waterway,” said Elkins. He pointed to Grand Ferry Park as a positive example, where low-lying riprap allows visitors to interact with the water or sit on the rocks, but contrasted the small, older park (built in 1998, with an update in 2008) with newer, flashier development. The much-touted Domino Park, he said, has plenty of amenities, but offers very little interaction with the water. Same for Greenpoint Landing, which has a riprap shoreline, but prevents access or connection with a railing at the top, along the paved esplanade. One of the key points at the DCP meeting in Greenpoint was that DCP has no real enforcement authority beyond setting design minimums. Agency representatives were quick to point out that DCP expanded the language to make room for more ambitious “design forward” projects from developers, but so long as the minimums were met — paths so many feet wide, benches every so often, a certain number of trees or square feet of ground cover — they had no real enforcement authority to hold developers to a higher standard. The real estate interests putting up glossy towers full of multi-million dollar condos were more than welcome to invest in innovative public space along their waterfronts, but only if they wanted to. The efficacy of community feedback can be hard to measure, however, as any Brooklyn resident that has sat in on a “visioning session” can probably attest. Grassroots efforts to put pressure on developers decades after city planning decisions have been made — and some developments have already been built — is seen by many as too little, too late. If DCP doesn’t include binding language in their plans for rezoning, accountability for developers could be found in the ULURP process that guides rezoning. But as the community board, City Council and borough president make recommendations to approve developments, their discussions are often more focused on height requirements, air rights and inclusionary housing than they are in design. “It’s my regret I didn’t get on this message five years ago,” Councilmember Stephen Levin said at the Greenpoint meeting in December, acknowledging his constituents’ disappointment in the work. Levin said it wouldn’t be possible to make options into requirements for already approved buildings in North Brooklyn, but urged the community to “speak with one voice” about their expectations. Levin’s district also includes a portion of the Gowanus Canal, which now faces a waterfront rezoning. Though much of the new development along the North Brooklyn waterfront has been approved, and community organization hasn’t materialized on a larger scale, there is an opportunity for Gowanus residents to get ahead of the curve, using the lessons learned on the North Brooklyn waterfront to hold developers to a higher standard. Rock climbing walls may be ambitious examples for what a waterfront can look like, but the point made by the Gowanus Dredgers — that not all waterfront designs be derivative esplanades — is timely. Without binding language or agreements from politicians to enforce higher standards on the space, the path of least resistance is likely. Rezoning doesn’t come around often, but when it does, the effects and decisions are felt for generations, and literally set in stone.